The following notes contain tips for using the HybridForms Designer and make it easier to work with it. 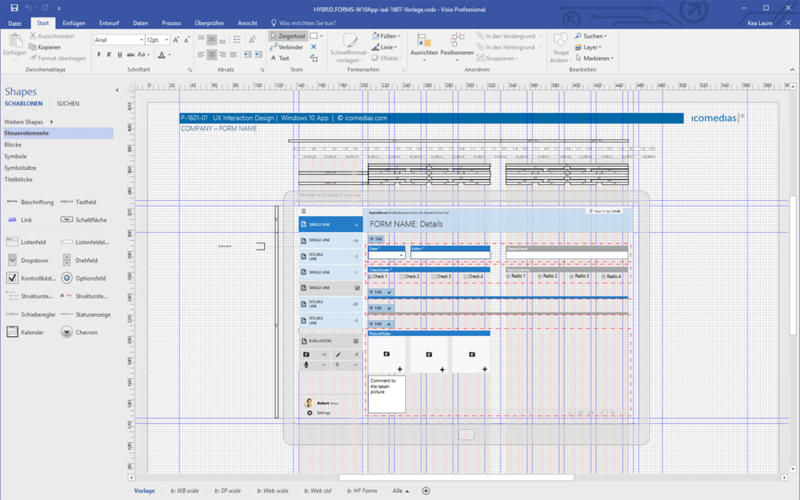 Use a Design tool like Microsoft Visio to make a concept for your form in advance. Working with the HybridForms Designer will then be easier as you already know where to put your elements. When labelling the fields, try to choose short, one-word and meaningful names for them. Otherwise, there is a lot of text and whenever the window size tends to be narrower, breaks might occur easily. This, furthermore, leads to a movement of the fields and might finally cause a content, which is hardly readable. Note: You will not see the breaks within the HybridForms Designer, even not within the preview mode, but later on within the HybridForms app. It is highly recommended to overwrite the given ID name for the controls by meaningful expressions. Especially when it comes to adaption of the form HTML later on and/or whenever a SQL report is required. The ID name can be found at the [Advanced] properties section of each control. Note: Do use simple characters to describe the control.